Hey everyone, welcome back! This coming Sunday is a big day for the life of the church according to the liturgical calendar and tradition – it’s our birthday! We cannot help but be drawn by the display and the sound of Pentecost, much like the residents and pilgrims in Jerusalem that day. Luke’s version of the Spirit’s descent is the standard by which all other experiences are measured. This is a bit unfortunate, because, really, how can anything stand against tongues of flame, speaking in tongues, and a sermon by Peter that converts 3,000 people on the spot? It’s tough to hold our own stories up to this one without feeling a little inadequate. Yet, there are two other stories about the Spirit bestowed on individuals to explore with today’s readings. In John, the coming of the Spirit is decidedly understated; Jesus simply breathes on the disciples, and there you go. In Numbers, the Spirit that is usually bestowed on Moses is divvied up and goes to 70 elders, who immediately prophesy. 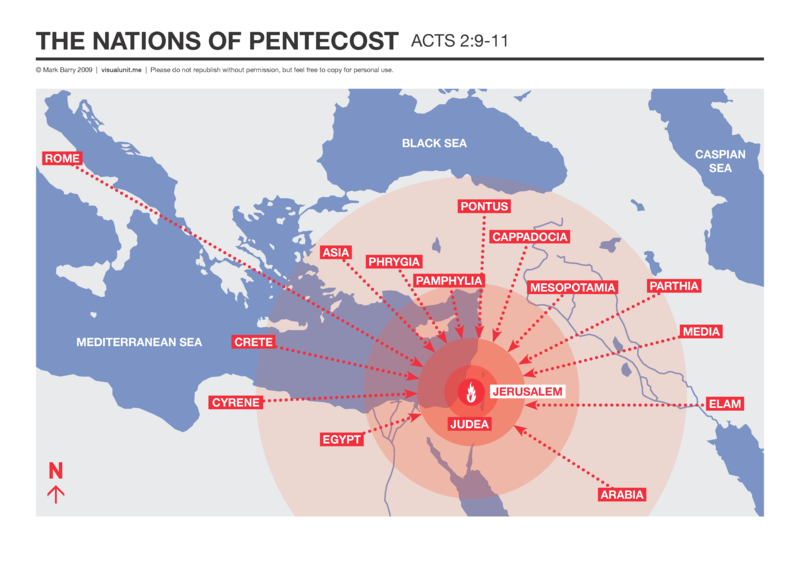 Is it possible that the Acts version of Pentecost is the Hollywood blockbuster and the other stories show the Spirit’s arrival happening in low budget projects or even everyday life? Let’s go see how the Spirit blows into our study and worship preparation. Starting out with BODY smart, we wonder what it might feel like to have the Spirit rest on you like it did the elders in the wilderness (or the disciples at Pentecost). We have some suggestions for you to illustrate and demonstrate this thought. After Eldad and Medad were turned in for unauthorized prophesying, Moses seemed to actually want others to join in so in MUSIC smart, we have an illustration of how old musicals often had more and more people join in a song. The gathering of elders got David to thinking about the 1948 Declaration of Human Rights, which we use in PEOPLE smart. We also wonder if maybe the Spirit was parceled out to the elders to allow as many people as possible to hear directly from God at a given time. In SELF smart, we wonder if Moses was actually delighted to share the responsibility and burden? I suspect he was! MATH smart – the distribution of the Spirit may be like the distributive property in algebra! Themed clubs – hefty price tag! 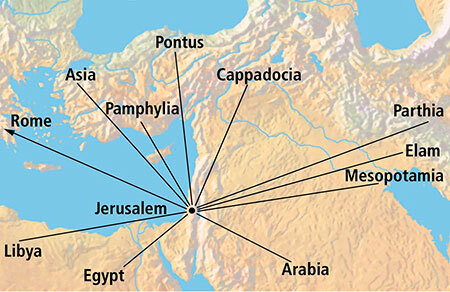 Luke takes the time to include a long, tongue-twisty list of the nations represented in Jerusalem at the time of this particular Pentecost feast. We suggest getting maps (or clicking on the ones we’ve linked to below) as an EYE smart illustration to show where all these folk came from. The profusion of languages amazed and puzzled the people in Jerusalem and some of those present accuse the disciples of being drunk. Peter steps up, proclaiming they are not drunk and then launches into his famous sermon. Using his defense of his fellows, we provide a movie clip in BODY smart and a link to a list of non-alcoholic possibilities for drunken behavior. The sound of wind is the attention getter in this story and in NATURE smart, we have a link to a wind “generator” that could produce a similar sound! Or just annoy your house mates – your pick. Peter and the other disciples undergo a remarkable and quick transformation when the Spirit comes on them which we think could be illustrated in PEOPLE smart with a clip from the movie The Mask. Also, Peter’s change from a Galilean fisherman to a man who goes into the home of gentiles has the hallmarks of the epic hero journey! Pouring out fire? Be careful! Symptoms of drunkenness without consuming any alcohol. NATURE smart – A wind noise generator! Amaze your friends and scare your pets! Some wind sounds. And some more. This selection from John’s account of the resurrection ends with Jesus declaring that the disciples, having received the Spirit, now have the authority to forgive sins. Whoa, Nelly! For observant Jews, this would have been big news! In MATH smart, we have a Venn diagram that shows just how monumental this declaration is – and does it apply to us as well? Scholars suggest that this scene where Jesus breathes on the gathered group and tells them to “receive the Spirit” is John’s version of Pentecost. It’s a lot less flashy and noisy, isn’t it? In BODY smart, we think it could be equated to spiritual CPR. The idea of being breathed into made me think of a popular song from some years back that we link to in MUSIC smart. And for PEOPLE smart, we quote a couple theologians who grapple with the idea of what peace and forgiving sins might look like for those disciples and for us. MATH smart – Venn Diagram – Who can forgive sins? BODY smart – Is Jesus breath spiritual CPR? GenOn Ministries has a definition of worship we’ve always loved! Image credit: Copyright: arcoss / 123RF Stock Photo. Used by permission.